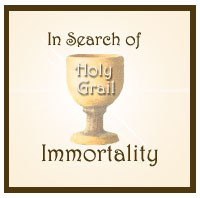 The quest for the Holy Grail is a spiritual quest, because it isn’t a physical cup. Jesus asked His disciples could they drink from the cup He drank from? He wasn’t referring to the wooden cup He passed to them at the Last Supper. Jesus was talking about a spiritual cup, the bitter cup He referred to in the Garden of Gethsemane, giving His life for the benefit of everyone else – the Cup of Life, which leads to Immortality. For Jesus, it began as a Cup of Sorrow. He came to save man and teach him Truth and about Father, the Ruler of the Universe. He asked us to believe Him and return to God’s Law. With this knowledge and what we know now about His message, Christ should have been made King and High Priest; but instead He was ridiculed, rejected and crucified. But as mediator, Jesus prayed for the ones who believed Him, “And the glory which Thou gavest me I have given them; that they may be one, even as We are One: I in them, and Thou in me, that they may be made perfect in one; and that the world may know that Thou hast sent me, and hast loved them, as Thou hast loved me. Father, I will that they also, whom Thou hast given me, be with me where I am; that they may behold my Glory, which Thou hast given me: for Thou lovedst me BEFORE the foundation of the world. O righteous Father, the world hath not known Thee: but I know Thee, and these have known that Thou hast sent me” (John 17:22-25). What a wonderful prayer to Father for those who believe Him, still. Jesus said, “Likewise also the cup after supper, saying, This cup [is] the New Covenant in my blood, which is shed for you” (Luke 22:20). The sacrifice of His life (blood) as the Lamb of God would redeem the People Israel from the death-penalty clause from breaking the Old Covenant with Father, essentially for adultery against Father. His sacrifice didn’t replace the need to follow God’s Laws given in the Torah, but it gave everyone a new start. A chance to repent and “keep and do” the Laws given to us at Mt. Sinai after the “I AM” used Moses to save us from the Egyptian rulers and their slavery. It’s actually quite an awesome concept to think that returning to God’s Law would save us from any kind of slavery, from any kind of evil ruler. Jesus knew it would take being crucified to save the nation, because most everyone rejected Him. And He was sad; and even asked Father if it truly needed to be done: “Then saith he unto them, My soul is exceeding sorrowful, even unto death: tarry ye here, and watch with me. And he went a little further, and fell on his face, and prayed, saying, O my Father, if it be possible, let this “Cup” pass from me: nevertheless not as I will, but as Thou [wilt]” (Matthew 26:38-39). Jesus did Father’s Will. He was an obedient Son with absolute faith in Father. And even when He and His disciples realized He was being set up, Peter wanted to defend Him, but Jesus said, “… Put up thy sword into the sheath: the “Cup” which my Father hath given me, shall I not drink it?” (John 18:11). Jesus also knew the Holy Spirit would come after His sacrifice, which would mean everyone would have direct communication with Father as He did. “And I will pray the Father, and He shall give you another Comforter, that he may abide with you for ever; [Even] the Spirit of Truth; whom the world cannot receive, because it seeth him not, neither knoweth him: but ye know him; for he dwelleth with you, and shall be in you. I will not leave you comfortless: I will come to you (John 14:16-18)… Nevertheless I tell you the Truth; It is expedient for you that I go away: for if I go not away, the Comforter will not come unto you; but if I depart, I will send him unto you” (John 16:7). During the Last Supper, the disciples asked Him if they could drink from the cup. Jesus replied, “… Ye shall drink indeed of my cup, and be baptized with the baptism that I am baptized with: but to sit on my right hand, and on my left, is not mine to give, but [it shall be given to them] for whom it is prepared of my Father” (Matthew 20:23). The Cup of Life is the Cup of “Self-sacrifice”, or crucifying the self, just as Jesus had done to fulfill Father’s Will. Once this is done, Christ’s spirit can live within a person, as Paul said. Becoming like Christ is being spiritually reborn. Thus, a person must put their spiritual foot on the neck of the human-animal self, figuratively speaking, and keep it there! At the Last Supper, Jesus passed the cup, and said it represented His blood, His life. He also broke bread and said that it represented His body. “And when he had given thanks, he brake [it], and said, Take, eat: this is my body, which is broken for you: this do in remembrance of me (every time you eat or drink remember my teaching and “Self”-sacrifice and follow my example daily). After the same manner also [he took] the cup, when he had supped, saying, This cup is the New Covenant in my blood: this do ye, as often as ye drink, in remembrance of me” (1 Corinth 11:24-25). Jesus meant for us to think of Him, His teachings and self-sacrifice every time we eat or drink. For us human animals, this would be often and necessary for living. We should also remember He chose to come here and be in a human-animal with us and have to maintain a body out of love for us. Every time we eat or drink, we should remember His sacrifice and His example on overcoming the self, daily, and what He had to go through by becoming a human+Being to help us. “Wherefore whosoever shall eat this bread, and drink [this] cup of the Lord, unworthily [whilst still committing sin], shall be guilty of the body and blood of the Lord. But let a man examine himself, and so let him eat of [that] bread, and drink of [that] cup. For he that eateth and drinketh unworthily, eateth and drinketh damnation to himself, not discerning the Lord’s body” (1 Corinth 11:27-29). Basically, walk the talk. If we want to follow His example, follow Father’s Law and have complete faith. “Ye cannot drink the cup of the Lord [the cup of “Self”- sacrifice], and the cup of devils [selfishness]: ye cannot be sharers of the Lord’s table, and of the table of devils” (1 Corinth 10:21). The Cup of Immortality, the Holy Grail, can be spiritually drunk-from by being Christ-like, which is a daily decision, thought and action. With this, Father will know we are worthy of entering Heaven again.